This is the 6th year of the Virgin Labfest where untried, untested, unpublished and unstaged one-act plays by emerging and well-known playwrights, directors and actors, will be performed from June 22-July 4, 2010 at the Tanghalang Huseng Batute (Studio Theater), Cultural Center of the Philippines at 3:00 pm & 8:00 pm. I have been a follower of this theater project every year and I'm excited to watch this year's offerings in VLF6. It is just a joy to see good works onstage. Hope to catch all shows. The event is a joint venture of CCP, Tanghalang Pilipino and the Writers’ Bloc, Inc. in cooperation with the Philippine High School for the Arts (PHSA) and Japan Foundation Manila Office (JFMO). Read the details about the Blog Contest. 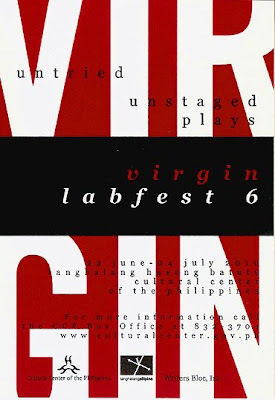 For updates, pictures, links, articles, etc., visit the Virgin Labfest's Facebook page here. For the Festival schedule in Microsoft Excel format, click here. For further inquiries, please call the CCP Performing Arts Division at (632) 832-1125 local 1607 or 1606, or visit the website at www.culturalcenter.gov.ph. Puede akong July 3 and 4! :-D Hope to see you!